While I don’t blog a lot personally, I tend to write posts about major life transitions (like this one and this one). So here’s one more. One that I’m very excited for. From 2010-2012 my commute took almost 3 hours round trip. Every day. So when I started looking to leave that job, one of my criteria was ideally to find a job with a shorter commute. Of course the most important things are the job itself and the company, but finding something where I could spend more time at work and with my family was also important. When I connected with the team at Ektron, I knew it was a good fit. It got me back to a horizontal technology, and helping people build great websites. It also fit my product marketing sweet spot, providing lots of opportunities to work on the things I love to do. Plus it was a much shorter commute in terms of time. I’d cut my commute time in almost half. It was a long drive from home to the office in my opinion but well worth it. I’ve racked up more than 21,000 miles over the past year plus making the commute. Shortly after I started at Ektron, I had the opportunity to expand my scope and skills by taking on responsibility for both product and inbound/content marketing. Now I’ve been creating content to drive marketing results for a long time, (longer than I’m going to share here), but having the chance to build my skills and our team to use content to help prospects find us, engage and convert was extremely exciting. Over the past year, I’ve seen the power of content, and found religion – great content, in my opinion, is the foundation of almost all marketing today. Without that content, your marketing efforts are less impactful and more expensive. And who wants that? Content marketing has become one of, if not the hottest concepts in marketing today. The Google Trends below support that. At the same time, content management (Ektron’s core business) is a much tougher business proposition. Content management is from dead, as everyone needs it, and most people already have it, but it can be a long, tough sell. While I was building my content marketing skills and having become truly convinced that this was the way forward, I had the opportunity to meet and work with the world’s leading content marketing evangelist, Joe Pulizzi, from the Content Marketing Institute (CMI). If you know anything about Joe, or CMI, you know that orange is their official color. 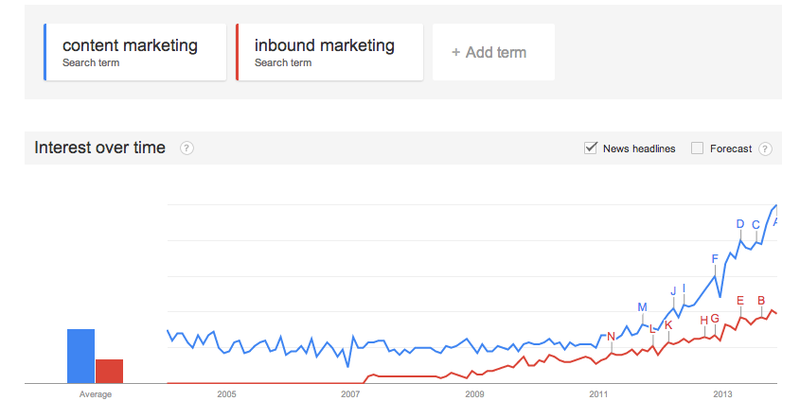 And content marketing is taking off. So the way I see it, orange is the new black. Sorry, just had to get that in there. Joe and I chatted about ways I could help CMI grow. It was pretty exciting to me. The job built on what I loved to do and would also give me an opportunity to develop new skills. In a super hot space. And I wouldn’t have to commute. At all. As much as I loved the people at Ektron, and was excited about some of the cool stuff the company was working on, I knew that all these journeys happen for a reason. 21,000 miles later, I knew that joining the CMI team was the next stop on this roadtrip. Today’s my first day at CMI. The 5 steps and 3 seconds it took to walk from my kitchen to the office was the best commute I’ve seen in well, ever. The daily journey will be much shorter, but extremely exciting. I can’t wait to get behind the wheel. As I wrote about in my last post, I’ve been working on finding my next career destination that allowed me to follow my passion. This post answers the question of where that is going to be for me. Way back in the days before the Internet, if you can even imagine that, before big box retailers put the squeeze on small, local shopkeepers and made price the driving decision factor in many sales, customer experience mattered. It mattered because those experiences in a local retailer were based on relationships. The retailer frequently lived in the same town as they buyers and knew them personally, by name. The retailer knew that repeat business, from loyal customers, was the key to a long term, thriving business. So they took pride in building and keeping that relationship strong. Over the past 20-30 years as new technology and market forces have emerged, some would argue that the personalized buying experience of old has disappeared. I don’t think it’s disappeared entirely, but as more consumers have more buying choices, and the ability to find sellers without regard to geography, size or other factors, finding the lowest price drives a significant number of purchasing decisions. However, a great experience can still be a major differentiator, and allow a seller to maintain a premium price, or simply win and keep more business. Many of the great brands today do that. Starbucks, who can sell a commodity, coffee, at significantly higher prices than many of its competitors is a classic example. Yes, some of the products cost more to produce, but Starbucks places a premium on delivering a great buying experience, from the music in the store to how you pay. Premium hotels like the Ritz Carlton help justify their price points because of exceptional customer service, doing everything in their power to make guests happy and keep them coming back. I’m sure anyone reading this can think of at least one exceptional customer experience in their past that helped them either choose a vendor or stay loyal to one. About 10 years ago, while working at Macromedia, and had been working on things like content management, personalization, and Rich Internet Applications. The web was still really in it’s infancy at that point, but the company tagline was “Experience Matters.” We believed that rich, quality, customer-focused web experiences allowed companies to differentiate themselves so they could win and keep more business. 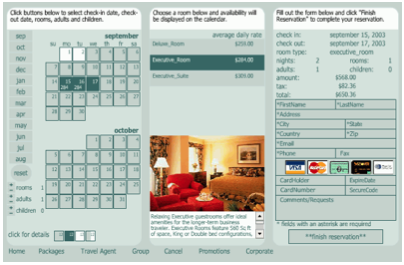 Some of you may remember that – here’s a white paper about what a great online experience was like back then. However, that was only the tip of the iceberg when it came to online customer experience. The ability to truly connect all your digital customer touchpoints, measure return, and quickly and easily make changes that have impact just wasn’t there in 2003. Marketo and Hubspot didn’t even exist, smartphones (and the app revolution) were only used by a sliver of the population. Tablets were either pills or pads of paper. Fast forward to the end of 2012, and here we are, in my opinion, at a seminal point in online experiences. In the past few years, almost everything in marketing has become measurable and you are truly able to connect the front end of a website (where those experiences matter) with your CRM system, your marketing automation system, your social networks, your content management system, and just about anything else you can think. There has never been a more exciting time to be a marketer. Because of the interconnected nature of all the systems that empower online marketing, you can now fulfill that vision that Macromedia put forth at the beginning of the century. Now more than ever, can you not only have a great customer experience online, but you can measure and adjust to optimize your results. Those results aren’t just about acquiring more customers, but they are about building loyalty and keeping customers. Tying that all together now has it’s own category – Digital Experience Management. And the foundation of it all? Content. Content fuels great experiences on a website or in a mobile app. Content empowers your email campaign. Content provides the way you will get found by a prospect, and how that prospect will learn about your goods and services. Content helps your customers make the most of your products and boosts loyalty. Content helps those customers share your brand and your products with their social connections. Now back in the day, when I worked on content management, personalization and helping companies create great online experiences I was extremely passionate about the technologies I marketed and who my customers were. Add in all the new amazing things that are now possible that stem from a content management system, and that only will increase my level of excitement and focus. So that’s where this path is leading me. I’m going to help Ektron grow and acquire customers for Web Content Management and Digital Experience Management. I’ll be helping companies create great online experiences – experiences that matter. I can’t wait to get started. A few months back, I woke up with an odd feeling. Something wasn’t right. Ok, it wasn’t just one morning, it had been coming on for a while. But I finally figured out what it was. I was missing my passion. Now I’m passionate about a bunch of things. My family, music and photography to name a few. I’ve always been lucky enough to work for companies where I’ve been passionate about my customers and the products I marketed. As much as I enjoyed working at Bullhorn, I knew I no longer had that passion. Now don’t get me wrong, working at Bullhorn has been great. I’ve enjoyed learning about and marketing cloud computing, applicant tracking, CRM, helping the company grow 40%, and get acquired by a private equity firm. I’ve enjoyed learning about the complexities and nuances of recruitment firms and this niche industry. Agency recruiters can sometimes have a bad rep, but I’ve met many of them over the past 3 years that are truly invested in helping companies find great people and people find great jobs. In my time at Bullhorn, the recruiters using the Bullhorn platform have placed ~2.4 million people in jobs. That’s amazing, and I’m thrilled to have been a part of it. But when I woke up and realized that the passion for recruitment wasn’t there, the fire had gone out, I knew exactly why I woke up with an odd feeling. It was my gut instinct. It was reaching up from inside, and socking me in the stomach. There it was. It was telling it me that it was time to find something new, something that would rekindle that fire, something where I’d jump out of bed in the morning and couldn’t wait to get to work. So I set out on the path. I realized that I’ve had that passion in the past, working for companies that provide technologies 1 or 2 layers down in the stack, something that helps an organization build or deliver an app or experience, as opposed to a technology that is used almost exclusively by business users. Working for companies like that was where I learned about how software works. Selling and marketing to customers that fit that profile was where I had that passion. My end goal was clear. Find a great opportunity at a company that provides software to that enables their customers to build something awesome. Now that that journey is coming to a close, I want to reflect for a bit. I had the pleasure of getting reconnected with some of the great folks I’ve worked with in the past, to share the advice and guidance. I was able to learn about a bunch of exciting companies that I didn’t know a lot about before, and meet some great people working at those companies. That has been a wonderful part of the past few months. I was also able to meet and work some great recruiters both on the corporate and agency side of things. That also has been a great part of the past few months. Now I did go through a few odd interviews, where it was very clear that the organization culture didn’t align with what I was looking for or that the company had no idea how to manage a hiring process. I also had a number of candidate experiences that, if you are a recruiter reading this, let me digress from the point of this post for a bit, to give you one piece of advice as someone who has been engaged in a job search for a bit – invest in candidate experience. If you aren’t a recruiter, you can skip the next two paragraphs — It doesn’t matter if you work in corporate HR or for a firm, I really think that those that have jobs to fill need to do a much better job following up with people that apply to work at your company. Take the time to let them know that you did in fact, receive your resume, that you did in fact at least scan it, and what the status of that person’s candidacy was. I would say that a great majority of the jobs I applied for, even when a recruiter sought me out, simply went dark. Even if the role has been filled, or if the applicant is not a fit, find a way to follow up. No response at all is not a way to respect a potential future employee, as well as someone who could someday become a customer. If I’m presented with an opportunity to buy some of the software for firms that couldn’t take the time to actually follow up with me, I’ll certainly apply that experience to how I think about the company, and assume that same lack of consideration might apply elsewhere, perhaps in the sales or suppor process. But back to the point of this post – passion. As I went down this path, to find that passion again, I found a number of opportunities where I knew I could be passionate about the company, the team, the products and the customers. All of these opportunities had a few common threads – they are technologies that are adopted across industries and make the creation of online experiences faster and/or better. I’m very pleased that I’ve found one opportunity that connects what I’ve been passionate about in the past with some new areas that I know I’ll be passionate about going forward. I can’t wait to get started. I’ll be jumping out of bed to start my first day, and I fully expect every morning after that. I’ll tell you a bit more about it in my next post. I’ll end this post with a sincere thank you to everyone at Bullhorn and all the customers that I interacted with over the past 3 years. I learned a ton from you, and I hope you learned even just a fraction as much from me. It was a pleasure and honor. I’ll be rooting for all of you, just from a far. I was recently chatting with David Mendels, who works at Brightcove. 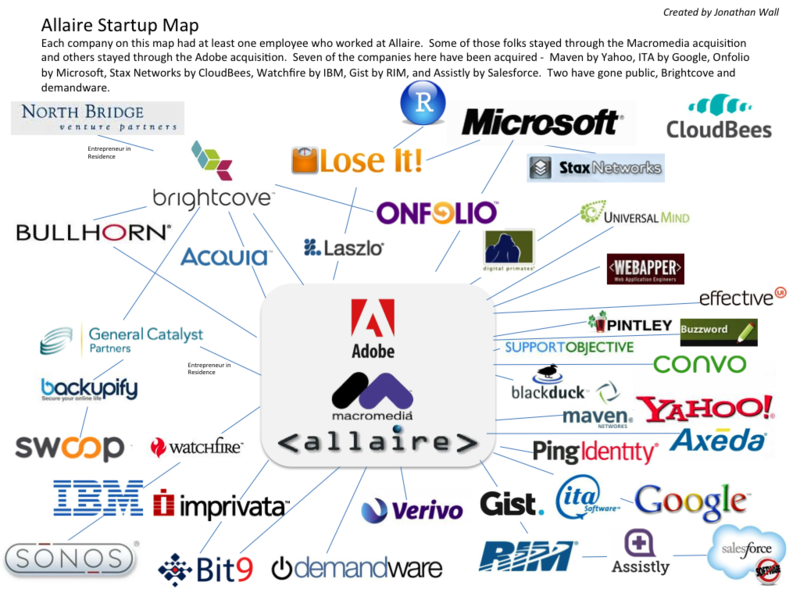 David mentioned that he thought it would be interesting to create a map of all the startups that have been fueled by people who worked at Allaire. I agreed that this would be interesting too, so I took at a stab at it in the picture below. My general guidelines were that someone at one of the companies on this map had to work at Allaire before the Macromedia acquisition. Those individuals could have stayed on at Macromedia, or even through to the Adobe acquisition, but if they left and wendtto a startup, I tried to capture it here. I’m sure I’m missing a bunch of companies. If you have some updates I should make let me know in the comments, via email, linkedin, facebook, smoke signals, whatever. And if we’re not already connected, feel free to drop me a line on twitter @jwall. You can see the full size version of the map here. Update: April 24, 2012 – Jeff Tapper and Rob Rusher mentioned that a few folks left Allaire, Macromedia, Adobe to go work at consulting startups like Digital Primates and Universal Mind. I’ll add those in as soon as I can. In the last days Verizon completed their work to bring FIOS to our street. All of a sudden we go from basically no choice for Internet tv and phone to having a choice. Woo hoo! This seems to be a hot topic in the neighborhood, so I can only assume that its a hot topic in places where you are lucky enough to have these options. One of my neighbors asked me for my thoughts and I figured it makes sense to share those here too. Now I’ve had Comcast in a few different locations and Verizon FIOS for about 6 months before we lived where we do now. I’ve also done a bunch with FIOS at my in laws house in the past few months. So intend to think I’m pretty well informed. The differences in each service are subtle in my opinionand in general they are very very similar. My overall recommendation is go with whomever will give you the best deal. That said here are the pros of switching to FIOS that I can see. 1) Multi-room DVR – For us having one DVR to set and being able to watch from any room is a nice feature to have. We tend to watch most things on DVR and starting downstairs and continuing upstairs is something we like. However, if you currently have multiple DVRs and are taping multiple shows on different DVRs at the same time, then switching to the FIOS multi-room DVR may be a limit and not a pro. 2) Speed. Download speeds are, as far as I can tell, comparable on both services, but my perception is that FIOS may be just a bit faster on download. If you are ever uploading large files, comcast maxes out at 5 MB and FIOS can give you 25 MB. But this is really only a difference if you are uploading large files (like a movie). That said, FIOS is much newer technology and I’d imagine that over time the speed advantage will improve with FIOS. 3) Price – If you have cell phones on verizon, you can bundle this with your FIOS plan and save 10/month. its not a lot, but its something that Comcast can’t match. 4) Network access. Both companies give you a router to connect your computers to their network. FIOS includes a wireless router as part of that and Comcast doesn’t. Depending on your home setup, this may be useful, or may be a hassle. I do a bunch of stuff to keep my network locked down, so the FIOS router is a bit of hassle, but once I have it all setup its not an issue. Comcast has a few small advantages when it comes to mobile apps. 1) If you have an ipad or iphone the comcast mobile apps I think are a bit better as you can get your home voice mail easily on an iphone with comcast and you can watch a number of shows on demand on iphone and ipad with comcast. I don’t believe you can do that with FIOS. 2) No digging. FIOS requires that they run a line from the street to your house. They do this by digging a trench in your yard and it may also need to go under your driveway or walkway. They are pros at this but I am a bit skeptical that they can run that line under my walkway without some issues around leveling. I haven’t ever had FIOS when they had to do this, but its something you should be aware of. 3) No big box in your basement or side of your house. FIOS requires a large box (probably 1 foot wide by 2-3 feet high by 3-6 inches deep) that centralizes the services to be installed. Its basically like a brain for your system, and comcast doesn’t have this. The FIOS install is long and complicated as a result. But that box is what makes the multiroom dvr possible for example. – that there are definitely some differences in on demand, specifically which shows are on which services. But I don’t have a lot of detail here. – Signal quality overall is a good one to explore more. the FIOS rep said that FIOS is higher quality at 1080i. But I haven’t noticed a significant difference. Again though because FIOS is newer technology, I would expect them to have the advantage over time. – Last thing to mention is to look at the difference in HD channels. there are a few differences, but nothing major in my opinion. Did I miss anything? Did I get anything wrong? If so let me know. Google Calendar of events via RSS? My job is very close to the major convention center in Boston. I’ve noticed that when I leave work and get on public transportation that if there is a major event at the convention center, that the public transportation line I take, the silver line, is extraordinarily jammed. Now you’d think that the MBTA, who runs the system here, would figure this out and add some more buses so people like me didn’t have to cram on top of other folks to make sure we can catch our train home on time. But that’s not what this is about. Because of this, I realized that I need to be more aware of big events at the convention center, so I can give myself a bit more time to catch my train on those days. It turns out the convention center has a good schedule of events online, but that isn’t something is easily viewable in a calendar format. Luckily they have a RSS feed too. So then I thought to myself, “Self, wouldn’t it be great if you could see this as a dedicated calendar, perhaps via Google Calendar.” That’s where I manage the rest of my non work events, so it just seemed logical. I wanted to simply create a new calendar, add the RSS feed of events, and have Google figure it out. But Google Calendar doesn’t enable that. I searched for a while to figure out if I was missing something, but I wasn’t. It seems there are a lot of people that want to do this though, so I figured I’d document my solution here. I learned that you can create a Google Calendar via an iCal URL. So then all I needed to do was figure out how to convert the RSS Feed to iCal. Here’s what I did. 1) I found this useful site to convert the RSS Feed to iCal. 4) I pasted the URL of the iCal feed into the “Add Feed” window that popped up. 5) That’s pretty much it. I had to make a few other tweaks to Google Calendar, like changing the name of the calendar. But if you want to see it, or use it, it’s here for all. Now I wish that Google would let me control permissions on the calendar like it does for native Google Calendars but that’s a pretty minor request. Overall, I’m happy I solved my problem quickly, and hope that others will benefit too. Like many people, I’ve been thinking about the year to come, especially since I’m kicking off the new decade with a new job, and a new place to live. I’m also looking back at all the amazing things that have happened over the past 10 years, and a lot of people are doing that at well. But I haven’t seen a list of the top technologies of the past decade that have gone mainstream and changed how people live or work. – Technology could be created or available in the 1990’s, or earlier, but didn’t go mainstream until the 2000’s. – Mainstream means that people that aren’t technology geeks first and foremost are using it. If you parents use it, grandparents use it, then I consider it mainstream. If you have a friend or acquaintance that doesn’t work in technology, or spend their waking hours playing technical support for friends and family, and they are using the technology then I categorize it as mainstream. – Changing how people live or work. Well that’s kinda obvious. But for the purpose of this post, I’ll include it if it changed how I live or work. And without further ado, here’s the list, in no particular order. Some of the commentary may be a bit obvious, but I’m trying to document how my life has changed, and perhaps in 10 years, look back on this post with fond memories. – Broadband. In the late 1990’s, I still had to dial up to get connected to the internet. But at the dawn of the new decade, broadband started hitting the streets and always on fast connections became a way of life. – Wifi – Huge. Absolutely changes the way I work and live. Increases the impact of broadband significantly. I don’t have to worry about where I put my computer in my house. I can use it anywhere. I can take my laptop with me anywhere I work and not have to worry about finding a connection. I can take my computer with me to a coffee shop, a library, and be productive. And how do I know its mainstream, again that’s obvious, but my litmus test is my parents now have it in there house. Now that’s not for them to use just yet, but its there if I want it. If we only had wireless battery recharging, that would be awesome. -Bluetooth – Like wifi, a very big deal. Wireless headsets and mice help free us from the cords. I don’t have bluetooth integrated from my phone to my car, but thats a high impact technology right there. – DVR – A game changer. I think you could get a Tivo in the 1990’s, but this definitely went mainstream in 2000’s. I’ll record shows even if I’m home when they are on, just so I don’t have to watch commercial. I can now watch 3 hours of network/cable TV with commercials in 2 hours. Pause a show and return in a few mins – that’s just huge, especially when you have a 4 year old who can interrupt whatever you are watching at any time. Needless to say, this also has massive implications for the advertising market. – On demand television- this was more or less available in the 90’s as pay per view, but its changed how consume television. With the combo of on demand and DVR I can pretty much watch what I want when I want. Now the question of is there anything good on is another story entirely. – Netflix – Its like an extension to on demand. This game changer has rendered the video store obsolete. – MP3’s and digital music – In 1997, on my cross country trip we had a mix of tapes and CDs. But we needed a special adapter for the tape player in the car to be able to connect to a portable CD player. Turns out that didn’t work, but that’s another story. As the early 2000’s rolled around digital music became prevalent, and for me, by the mid 2000’s, my historic tape and CD collection was gone. It was all digital. (Man, burning 400+ CDs took a long time). On a related note, in the mid 1990’s I had my car broken into and some of my favorite tapes and CDs were stolen. I was pretty upset as some the mixed tapes I made in college were really hard to replace. But fast forward to today, and now its all backed up, so the likelihood of losing any of my music is very low. Makes me think that in addition to in home backup, I really should get an online backup service like Carbonite. What’s also interesting here is that in the 1990’s most people had VCRs and the DVD was starting to come into people’s lives. Like any media for music or video, it seems to have about a 10 year lifespan. Records were around for a long time, but then we cruised through 8-track, tapes, CDs. Video went from VHS, to DVD and now to blu-ray, but I’m sure that will all be gone in 10 more years for a completely digital on demand world. – GPS – You could get a GPS in a rental car in the early/mid 1990’s. But it didn’t become mainstream, with many car’s having it as an option or standard, and included on smartphones until the 2000’s. Printed maps – gone. AAA Triptiks (which I used extensively in my 1997 trip across the united states), done. – Smartphones – These were around in the mid/late 1990’s. And in the 1990’s Palm had a major market of 3rd party apps. So what we have today is nothing new in my opinion, except that the phones are faster, smarter, better and include wifi and GPS. . But the smartphone didn’t go mainstream until the mid late 2000’s. Its mainstream in my book because my mother is considering getting an iPhone so she can play games. – Online banking – This was around in the early/mid 1990’s. Today, I assume most people pay their bills online, but I know a number of folks that prefer to write and mail checks. Online banking took a chore of managing bills that took people a chunk of time each week or month, down to a few seconds and clicks. I think many people will say that this isn’t as impactful as some of the technologies above, but its definitely mainstream and definitely a game changer. I’m hoping that in the next 10 years, I won’t ever need to get a bill or statement by mail. – Digital photography and video – This is a late breaking addition after I originally published the post. Thanks to Peter Conrad for helping me realize I overlooked a huge one. This has completely changed how we take pictures, how we develop film (we don’t) and how we store our memories. The biggest change for me at the end of this decade though is video. When my son was born in 2005, I had a digital camera for taking still photographs and a tape based recorder for video. I took a few early videos, but the conversion to digital was a major hassle, so I took mostly still photos. Now I take videos first and pictures 2nd, mostly on my phone. I wish I had better quality on my phone but that will happen over time. Wow, that is just an amazing list. In spite of all the crazy things that happened to us over the past 10 years, it was simply a mindblowing decade for technology. Technology to watch for in the 2010’s. These are things that I see as major life changers in the next 10 years, and I expect them to all go mainstream. – Person to person payments – You can do this today a bit, but its hard and costly. I know banks have dabbled in this, Paypal is working on it and with new payment systems like Square, I think this will be a reality very soon. The big question is, will you carry cash at all in 10 years? – Wireless battery recharging – I’m not talking about the ability to charge a device by placing it on a special mat. That’s very cool don’t get me wrong. It cuts the wires for the most part. I’m talking about a device to charge, or maintain power without any cords and without being on a special pad. Its wifi for charging. I want it and expect to see it in the next 10 years. So what did I forget? What are you looking forward to in the next decade?